You don't want your paint running over onto the ceiling or a different coat of paint, do you? For this reason, decide whether you are going to use painter's tape or angled brushes. Both come with advantages and disadvantages. Painter's tape takes a lot of setup but doesn't require a steady hand. You'll have to apply the tape very evenly to avoid bleeding, but once it's on the wall, you won't have to worry much about messing up. Angled brushes don't require much setup, if at all, but can cause mistakes if you don't have an even hand. Still, they may save you hours of prep time if you feel comfortable using them. You're dealing with a new wall that hasn't yet been painted. You patched any holes, scuffs, etc. on the wall. The color you're painting over is darker. Dip a 2 ½-inch angled brush into the desired color; dip only 1/3 of the way down the brush, tapping the color from the paint brush instead of brushing it off. Hit the corners and edges of your room with the angled brush, leaving about 2 inches (5.1 cm) of color around the edges. 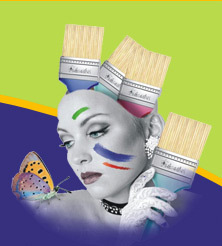 Load a paint brush by dipping the bristles half way into the paint and tapping them on the inside of the bucket. For easier cleaning after the job, first dip the bristles in the solvent that is the base of your paint—water for latex and mineral spirits for oil—before painting. This will keep the bristles at the ferrule from drying out before you can clean them. To cut in a straight line, press the tips of the bristles against the wall just enough to arch them but not enough to paint with the sides of the bristles. The slight pressure delivers the paint stored between the bristles to the tip of the paint brush and onto the wall.